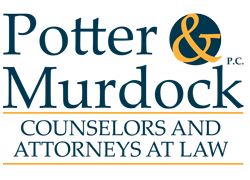 LITIGATION - Potter & Murdock, P.C. We regularly appear in the various federal and state courts in Northern Virginia, the District of Columbia, and Maryland, and elsewhere to represent clients in litigation and arbitration matters involving government contracts; employment related claims defense; ERISA and health benefits issues; False Claims Act qui tam claim defense; breach of contract and other business disputes; as well as personal injury, fraud, defamation, and other tort claims defense, and products liability defense. We work at competitive hourly rates, and offer alternative fee arrangements, including task, project and full case handling rates. Employers against claims of wrongful termination, fraud, discrimination, and defamation. Retailers against claims for unlawful collections practices and fraud. Retailers and other corporations against premises liability claims. Property managers and homeowners associations against claims for breach of fiduciary duty. Lenders and other financial institutions in consumer mortgage litigation. Corporations in Department of Labor audit disputes. Corporations in non-compete, non-solicitation, and non-disclosure disputes, and claims involving various business torts, including tortuous interference with business opportunity. Corporations as plaintiffs or defendants in disputes regarding breach of contract. Health benefit plans against benefit coverage denial claims. Managed care plans in defense of class actions brought by plaintiffs on behalf of over 60,000 physicians challenging defendants’ claims processing practices, including the alleged use of downcoding, claims editing, and alternate benefits to determine provider payments. Medicaid managed care plan in the TennCare Medicaid Managed Care Program against takeover by the Tennessee Department of Commerce and Insurance. Drug and alcohol rehabilitation program in state and federal False Claims Act investigation. Medicaid managed care plan in False Claims Act and Stark investigation of alleged provider referrals, kickbacks and reimbursement. Hospitals and health benefit plans against health care provider claims of wrongful denial of or loss of privileges or health care panel participation. Government contractors in federal False Claims Act qui tam actions. Trustee in case involving collateral attack on state court judgment. Government contractors in bid protests defending or challenging awards by various government agencies.